Did Chris Nolan clean up Bane's mumble mix for The Dark Knight Rises? A few weeks ago, there was a bat-rumor that Warner Bros. was freaking out over the public's reaction to Bane's muffled voice. Getting Chris Nolan to bend to studio will is a pretty difficult task, but this time it seems the studio has won. Bane apparently got a voice job. Will the studio make Christopher Nolan change Bane&apos;s voice in The Dark Knight Rises? "A friend of mine who is an IMAX projectionist told me they received a new soundtrack for the Dark Knight Rises prologue. He said it's now a combo soundtrack with Mission: Impossible – Ghost Protocol, but the cool thing about this is that they've cleaned up the dialogue. They've gone in and lowered the background noise of the plane and other things, thus making Bane's dialogue clearer and more understandable. He asked some people after they left the movie if they could understand Bane and they all said they had no issue understanding him, and were excited for the movie." 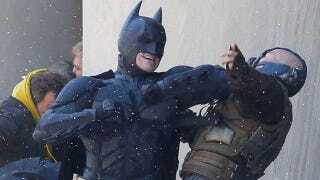 More importantly, does this mean Nolan is cleaning up Bane's chatter in the movie itself? Or was this an isolated, "only sounds like crap in the IMAX theater" incident? UPDATE: Apparently this whole story is false. No one has changed Bane's sound mix.